New images are being released to celebrate the International Year of Light 2015. 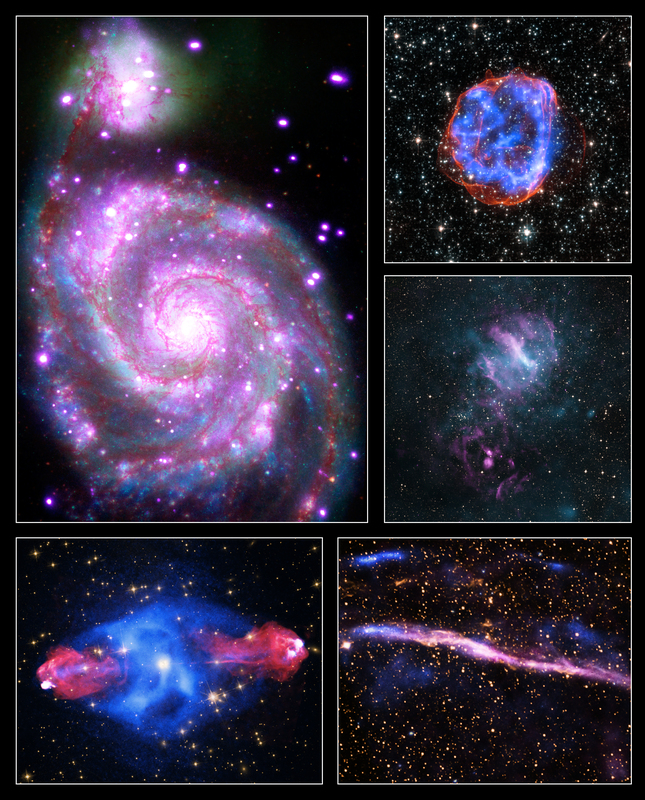 Each image contains X-rays from Chandra, along with data in other types of light from various telescopes. These images illustrate how astronomers use different types of light together to get a more complete view of objects in space. The year of 2015 has been declared the International Year of Light (IYL) by the United Nations. Organizations, institutions, and individuals involved in the science and applications of light will be joining together for this yearlong celebration to help spread the word about the wonders of light. In many ways, astronomy uses the science of light. By building telescopes that can detect light in its many forms, from radio waves on one end of the "electromagnetic spectrum" to gamma rays on the other, scientists can get a better understanding of the processes at work in the Universe. NASA's Chandra X-ray Observatory explores the Universe in X-rays, a high-energy form of light. By studying X-ray data and comparing them with observations in other types of light, scientists can develop a better understanding of objects likes stars and galaxies that generate temperatures of millions of degrees and produce X-rays. To recognize the start of IYL, the Chandra X-ray Center is releasing a set of images that combine data from telescopes tuned to different wavelengths of light. From a distant galaxy to the relatively nearby debris field of an exploded star, these images demonstrate the myriad ways that information about the Universe is communicated to us through light. This galaxy, nicknamed the "Whirlpool," is a spiral galaxy, like our Milky Way, located about 30 million light years from Earth. This composite image combines data collected at X-ray wavelengths by Chandra (purple), ultraviolet by the Galaxy Evolution Explorer (GALEX, blue); visible light by Hubble (green), and infrared by Spitzer (red). When a massive star exploded in the Large Magellanic Cloud, a satellite galaxy to the Milky Way, it left behind an expanding shell of debris called SNR 0519-69.0. 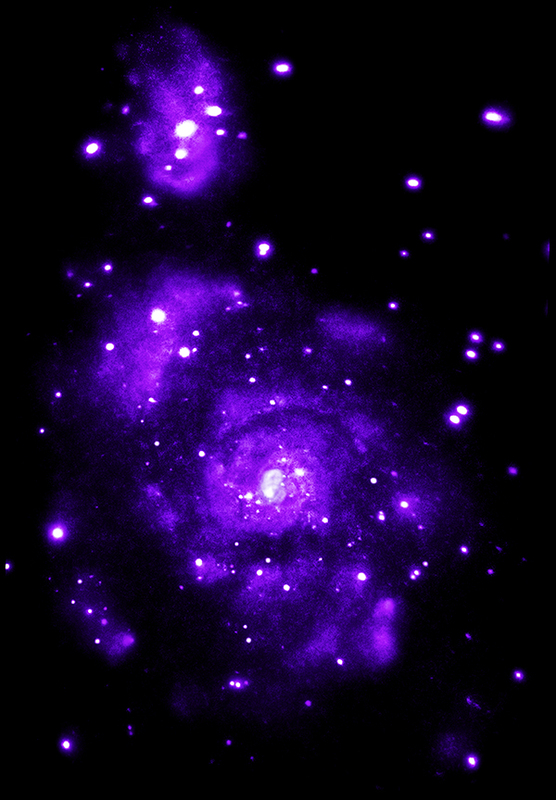 Here, multimillion degree gas is seen in X-rays from Chandra (blue). The outer edge of the explosion (red) and stars in the field of view are seen in visible light from Hubble. When X-rays, shown in blue, from Chandra and XMM-Newton are joined in this image with radio data from the Australia Telescope Compact Array (pink) and visible light data from the Digitized Sky Survey (DSS, yellow), a new view of the region emerges. This object, known as MSH 11-62, contains an inner nebula of charged particles that could be an outflow from the dense spinning core left behind when a massive star exploded. This galaxy, at a distance of some 700 million light years, contains a giant bubble filled with hot, X-ray emitting gas detected by Chandra (blue). Radio data from the NSF's Very Large Array (red) reveal "hot spots" about 300,000 light years out from the center of the galaxy where powerful jets emanating from the galaxy's supermassive black hole end. Visible light data (yellow) from both Hubble and the DSS complete this view. This supernova remnant is the remains of an exploded star that may have been witnessed by Chinese astronomers almost 2,000 years ago. Modern telescopes have the advantage of observing this object in light that is completely invisible to the unaided human eye. This image combines X-rays from Chandra (pink and blue) along with visible emission from hydrogen atoms in the rim of the remnant, observed with the 0.9-m Curtis Schmidt telescope at the Cerro Tololo Inter-American Observatory (yellow). In addition to these newly released images, the Chandra X-ray Center has created a new online repository of images called "Light: Beyond the Bulb" for IYL. This project places astronomical objects in context with light in other fields of science and research. Coordinates (J2000) RA 05h 19m 34.90s | Dec -69° 02´ 07.30"
Coordinates (J2000) RA 11h 11m 52.00s | Dec -60° 39´ 12.00"
Coordinates (J2000) RA 19h 59m 28.30s | Dec +40° 44' 02.00"
I find it most mind boggling as to how Astronomy, Astrophysics, and Cosmology has been pushed forwards so fast by the various space telescopes now in existence and the Web Space Telescope yet to be launched. This will greatly increase our knowledge even further and faster. Why can't I find a button to share this page on Facebook? These are so totally awesome. Thank you. Absolutely gorgeous photos, great layout of information. Thank you for all you do. This information and research is fascinating and the photography is fabulous. thanks to all who put it together.